George Orwell - too left wing for the BBC? It emerged this week that a proposed statue to the legendary journalist - and former BBC employee - was turned down by departing DG Mark Thompson because of Orwell's leftist allegiances. What does that say about the BBC - and its critics? An intriguing story has been rumbling away this week about the BBC and another great British instutition - also one of its former employees - George Orwell. The Daily Telegraph broke the story with a piece by Joan Bakewell in which she claimed that the proposal for a BBC statue to Orwell, in the piazza outside the new Broadcasting House in Oxford Circus, was turned down on the grounds of Orwell's politics. Inevitably, the British right did not take to that silly dismissal any more than the left did (outraged right-wing defences of Orwell from the Standard and Daily Mail cropped up immediately), or Orwell himself would have done - a PR snafu on pretty much all fronts for Thompson. 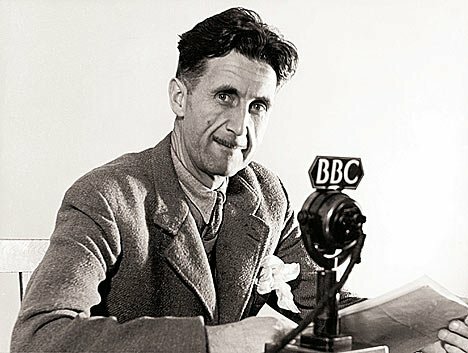 There was also a discussion on Radio 4's Today programme about Orwell's politics and the Beeb, which you can listen to here. Thompson has dramatically misunderstood Orwell and his many acolytes, of course (as much as the Mail's attempt to claim him for the right is equally ignorant - it amounts to HAVEN'T YOU READ ANIMAL FARM?!). In doing so, Thompson has also revealed a depressing level of hypersensitivity at the top of the Beeb: too scared of being perceived as left-wing to actually follow its conscience. With the constant attacks on 'bias' from Boris et al, maybe Thompson was right to be scared? “A meeting is now being arranged with Westminster Council by the BBC and the sculptor Martin Jennings to seek planning permission for the statue to go up in Portland Place itself, where it can be seen by everybody." So maybe the statue will happen after all, if George Entwistle shows fewer jitters over 'bias' than his predecessor? In the meantime I recommend a browse of the BBC archive of Orwell's contributions - for better, or indeed worse - during his time at the Beeb, producing wartime propaganda to be broadcast in India.